Hair extensions allow you to transform a short haircut into a long, beautiful hairstyle during a quick and easy visit to a hair salon near you in Marlton. Hair salons typically offer a variety of different hair extensions, and your hairdresser can help you choose the best hair extension material and application process for your needs and lifestyle. Bonded hair extensions are attached to your natural hair via small keratin bonds that are at the tip of each hair extension. The bonds are safely fused to your hair using a heated hairstyling tool. Many women prefer bonded hair extensions because they are comfortable, don’t pull at the roots, and allow you to achieve incredibly natural-looking medium hairstyles and long hairstyles. 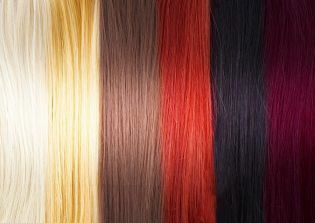 Bonded hair extensions can last as long as four to five months with proper care and maintenance. Be careful not to expose the keratin bonds to oils, conditioners, or heated hairstyling tools. When blow drying your hair, dry it from mid-length down first. Then flip your hair forward to dry the underside of your natural hair. Never use the hairdryer on your keratin bonds. An experienced stylist at a hair salon near you can provide gorgeous, natural-looking hair extensions near Marlton that will transform short hair into a luxurious, long hairstyle. Before getting hair extensions, you should prep your hair at home to make sure your hair extensions look better and last longer. 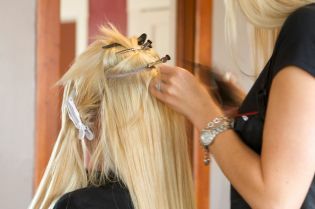 Here is some great advice on how to prepare your hair before your visit to the hair salon for hair extensions. Hair extensions will attach to your hair more easily, and last longer, if your hair is incredibly clean and free from oils. On the day of your hair extension appointment, wash your hair thoroughly with clarifying shampoo. If you apply conditioner, apply it only to the ends of your hair, and avoid the roots. Once your hair is dry, run your hands through it to determine if it’s still oily. If it is, wash your hair again, this time without using conditioner. Once your hair is completely dry, inspect your ends. If your ends are very blunt and your short hairstyle doesn’t have layers, it will be difficult for your hairstylist to integrate hair extensions into your hair. Before visiting your hair salon, simply separate your hair into large sections, and thin out the ends with thinning scissors. If you don’t have thinning scissors, or if you don’t feel comfortable doing this yourself, your hairdresser can do it for you. Just ask your hairdresser to look at your ends and give you a quick haircut to add some layers and texture to your ends. It’s important to arrive at your hair salon with your normal, every day hairstyle. This way, when your hairdresser attaches your hair extensions, you’ll know exactly what they’ll look like from day to day. Part your hair exactly how you usually do, so that your hairdresser will be able to add the appropriate hair extension volume to each side of your part.